Hello, here is my second sample to show you. 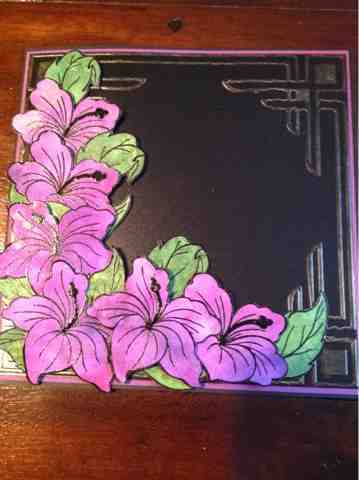 This is from the Hibiscus stamp plate. The picture does not show it vey well, but the flowers and leaves are coloured with luminart pourables. I initially distressed the paper using Distress Ink, and then apply the pourables with a damp sponge. Using black pearl card, I embossed it with an 8 x 8 folder and the raised areas I have applied gold wax to. Thank you for stopping to have a look. WOW this is fabulous Caroline!!! Love the beautiful flowers and the gorgeous lush colours. Absolutely beautiful, Caroline - those hibiscus are lush! I'd love those Hibiscus on my window sill, Caroline, they'd certainly cheer up this chilly weather. Love the colour of those pourables! !